Documents filed as part of Apple’s application to test self-driving cars in California were revealed on Friday and offer a first look at the company’s autonomous platform. 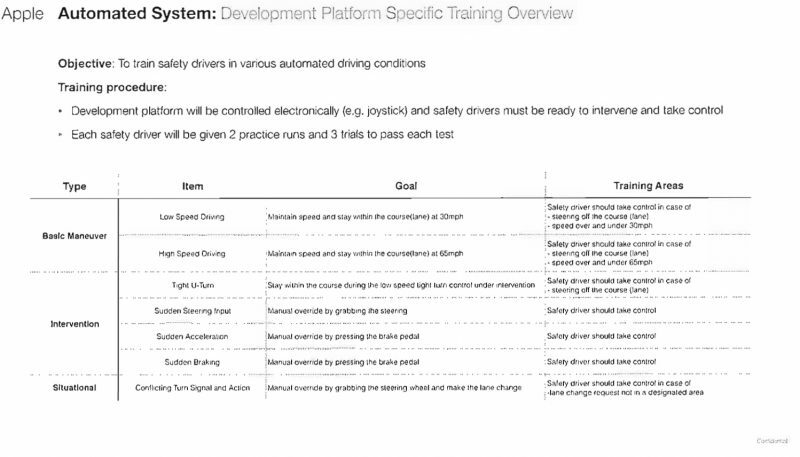 Obtained by Business Insider, the “Development Platform Specific Training” documents contain material designed to train potential safety drivers before they take Apple’s autonomous vehicles out on public roads. Drivers must pass basic tests ranging from basic maneuvering to vehicle systems intervention prior to certification. Based on the documents, drivers are required to pass seven tests as a part of their training before they are allowed to work with Apple’s software platform. Each driver must complete two practice runs and three trials to pass tests, which cover topics like taking control of the vehicle at tight U-turns, sudden acceleration, sudden braking, and more. 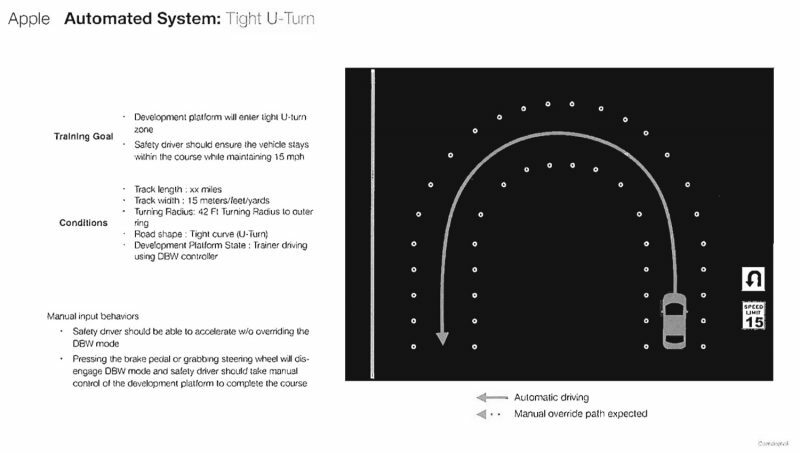 In a document detailing the correct method of performing a tight U-turn, Apple notes pilots can disengage the autonomous driving system by pressing the brake pedal or grabbing the steering wheel. Suitable drivers should also be able to accelerate without overriding the system. Apple last week was awarded a permit by the California DMV to conduct self-driving car tests on public roads. The granted permit covers three Lexus RX450h SUVs and six safety pilots who are mostly Ph.Ds with specialization in machine learning. Apple has long been rumored to be working on autonomous vehicle technology under its “Project Titan” initiative. The company reportedly abandoned efforts to create a branded car in late 2016 when former project leader Steve Zadesky left Apple and handed the reins over to senior VP of Hardware Engineering Dan Riccio. Project Titan was later transferred to longtime executive Bob Mansfield, who subsequently culled hundreds of employees and refocused the program on self-driving software and supporting hardware.